The dachshund is a small breed hound dog most famously known as the "wiener dog" due to the dog's long body resembling a hot dog. 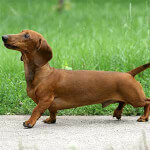 The dachshund has an elongated body with short legs and is commonly joked as being "half a dog high and a dog and a half long". The breed's unique body was intended to help it crawl deep into animal dens and holes to find game for hunters. The dachshund is a brave intelligent dog that can be stubborn at times. The breed has a lot of energy and enough stamina to keep up with hunters on horseback. They have an incredible digging instinct and an incredibly deep bark which many people mistake as coming from a much larger dog. The Dachshund was bred as a hunter. Over the last century or so, however, this formerly medium-sized, highly aggressive, and very versatile dog has been down-bred in size, made a lot less mean (even if they sometimes attack), and yet remains somewhat adept in accommodating work, duties, and tasks. While nearly no one uses these dogs for hunting, they are nevertheless classified as a Hound by the AKC and most all other kennel clubs. They are best for single people, they not good for large families, and they are prone to problems that need a lot of resources to deal with. Depending on their coat type, they may or may not shed excessively and require various levels of grooming. 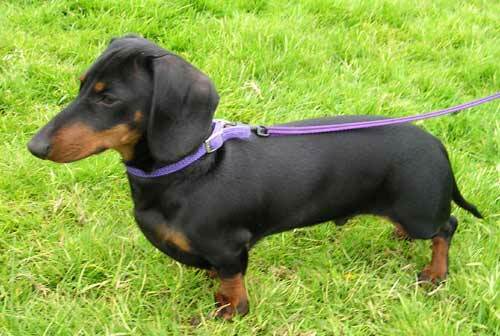 The dachshund breed can vary in size and coat. 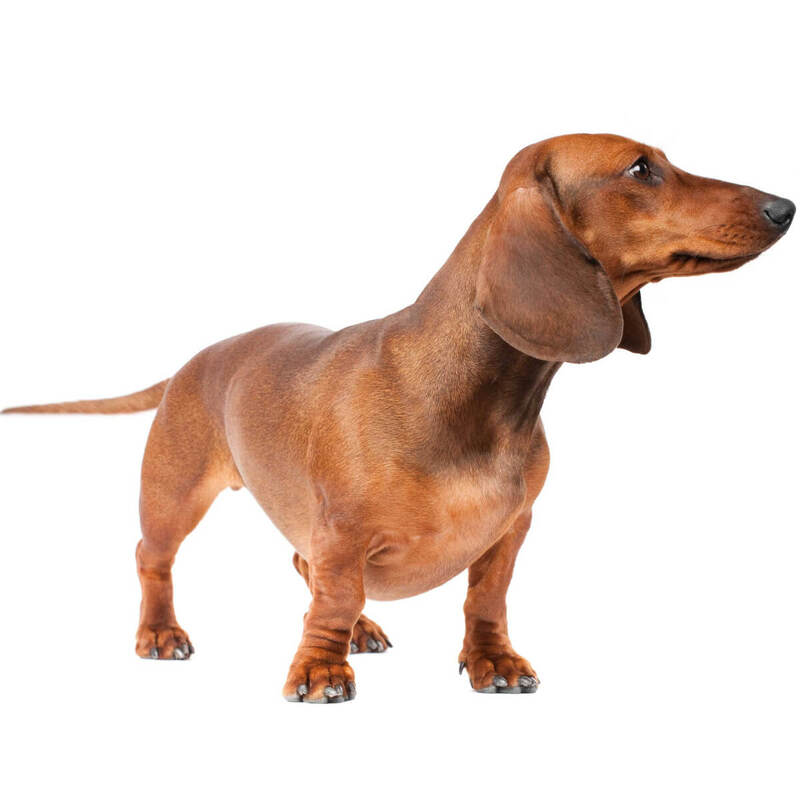 Their size is classified as miniature or standard (if a dachshund is between these two sizes they are often called a "tweenie"). Their coat can either be smooth, wire haired, or long haired. 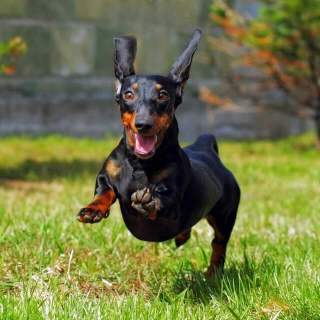 It is not uncommon for the dachshunds temperament to be different between coat types due to crossing terrier breeds with the dachshund to create a new variety of dachshunds with longer coats. The dachshund was originally bred to be the ideal dog to help hunt badgers. Generally, the dachshund would dig into badger holes to flush the animal out (or fight it underground if necessary). Through careful breeding, hunters successfully bred the dachshund which was large enough to defend itself from animals, narrow enough to squeeze through tunnels, and had a bark deep enough the hunters could locate the dog when it was underground. 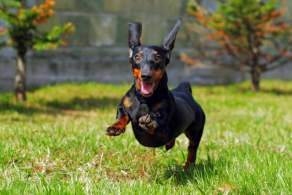 Dachshunds are intelligent dogs, but have a tendency to be stubborn at times so it can be a difficult breed to train for individuals unfamiliar with dogs. 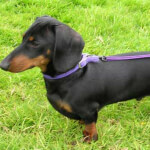 They are friendly with children who the dachshund considers part of the family, but they can be reserved towards guests. The breed does well with other pets, however they have a very bold personality so they may not get along as well with dogs that also have bold personalities. 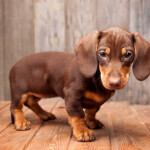 Dachshunds may be small and somewhat cute now, but the history of the Dachshund proves they weren't always this way. It's documented that they have been around at least since the 15th century. Back then,they were much larger, there were two distinct varieties, and they were used to hunt a variety of critters and predators. The origins of the breed is believed to have been in the early 1600s. 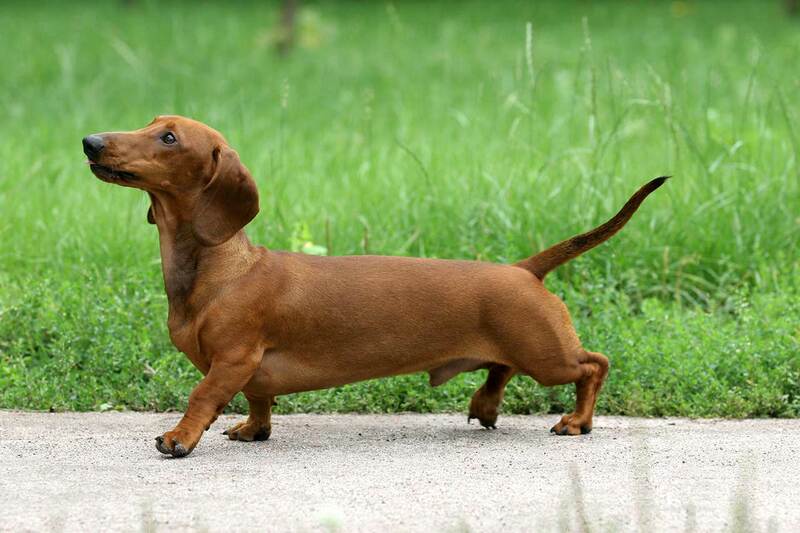 Breeders in Germany produced two varieties: the crooked-leg variety, which is the basis for the Dachshund we know today, and the straight-legged ones. Both types of Wiener Dog were bred for pest extermination and hunting. 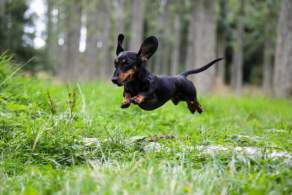 Back then, Dachshunds weighed around 35 pounds or more, and they often hunted in packs. They were used to bag badgers, wild boars, and wolverines, and they went to ground with a ferocity that occasionally surfaces to this day. A few decades later, in 1870, England formally recognized the breed. By 1881, the world's first Dachshund Club was founded. During this time, the dogs were taken to the United States and quickly became popular among the German and Dutch immigrant communities. The American Kennel Club (AKC) admitted Dachshunds in 1885. Although Germany had the first studbook, in 1840, it didn't have a club until 1895. They were kept by a wide variety of royals, celebs, and other famous folk. Queen Victoria of Great Britain and Napoleon Bonaparte of France were two such world leaders who had Dachshunds. Ironically, they were one of the most popular dogs at the Westminster Kennel Club Show the same year that World War I broke out, 1914. 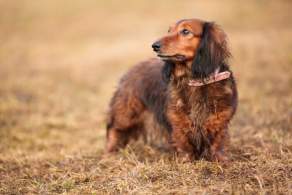 The irony is that during the war, anything from Germany or even related to the country's culture fell sharply out of favor, and this included the Dachshund breed. The AKC even changed the breed's name to Badger Dog, but the die was cast. Luckily, all this animosity faded away shortly after the war. The Dachshund anatomy is a unique one, and you probably know what they look like from one of the countless cartoons that have played on TV, in movie cartoon previews, and broadcast elsewhere during the last century. You may have even seen the 2016 movie, "Wiener-Dog." These sausage-shaped dogs are unmistakable. While the Dachshund coat is often the universal black and tan, it's the short legs and the long body that is the well-known image of this breed. They have large paws that make the short legs appear even shorter, and Dachshund feet are webbed. They have a long snout that is triangular in shape, leading back to a small, dome-shaped head in which are set round, black eyes. The ears are long and are folded down. 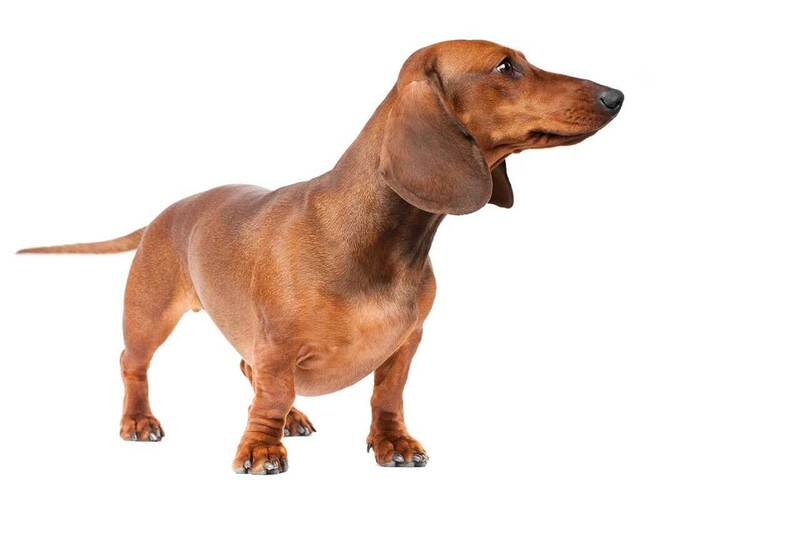 If you have a bearded Dachshund or one with a long coat, the ears may look like massive, furry butterflies. Although small dogs, they have a broad chest. Dachshunds have medium-length tails, and as there are two types of dachshund coats, the tails look different depending on that. They typically have bald tails unless they have a long-haired coat, which means they'll have a tail with the hair hanging down from the tail. Dachshunds come in a great many colors. You most likely seen the black and red ones, and you may have seen some of the others either online, at dog shows, or in person. 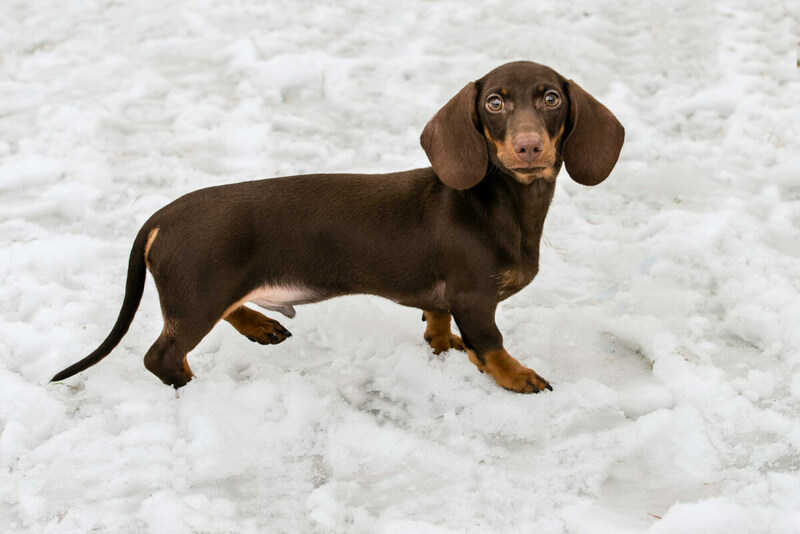 One of the most sought after coat colors is the dapple Dachshund, and a puppy of this kind can go for a lot. There is also double dapple Dachshund, and these Wiener Dogs are rare as well as fraught with medical issues, health problems, and birth defects. 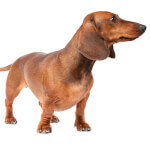 What is a dachshund weight and size? Is a full size dachshund really that remarkable? And how big are miniature dachshunds? These are all questions that may be asked by people who are just getting to know about the world-famous Wiener Dog. While a quote by the early 20th century writer H. L. Mencken won't answer the more specific queries, we here at Dog-Learn will. The average Dachshund weight is just under 20 pounds. They can get heavier, of course, but that is not typical and is too often from being overfed and under-exercised. The standard Doxie tends to be around 5 to 7 inches high once they reach their full adult height. Smaller variations can weigh much less but don't have too much less height. As for that quote describing a Dachshund's size? It's "A Dachshund is a half-dog high and a dog-and-a-half long." Initially, there were two variations of Dachshunds: straight- and crooked-leg. The straight-legged still exists but number far fewer than the crooked-leg variety, and it was this latter one which is the basis of all the other ones we know today: the short-, long-, and wire-haired varietals and the standard, miniature, and nearly unknown toy or kaninchen, which is German for "rabbit." There are also coat color varieties, but as Doxies come in nearly all colors, this is not really a variety — or we'd have to accept that there are several tens of types! There may be accepted exception in the double-dapple, however, as this kind is highly prone to many ailments. The most typical variety is the short-haired, crooked-leg, standard Weiner Dog, although this might imply that there are far more than the six mentioned above. As all the variations are crooked-leg, that's a given. Any of these dogs can come in one of the three sizes, and all of these sizes can have any of the three types of coats. This might cause some confusion, and you may be wondering, Do I identify a variety by it's coat or it's size? That's a good question, one that's yet to be answered. Most all Doxy owners and breeders tend to use either size or coat type, so the jury's still out on how to deal with this. 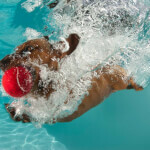 The big kennel clubs determine variety by size, however. Most everyone has heard of the standard and miniature Dachshunds, and both are recognized by the AKC and UK clubs. Only the Fédération Cynologique Internationale (FCI) recognizes the "rabbit" size, and this is not a kennel club but an international group of them. As these dogs are internationally renowned, the variations are often called by their non-English names: Langhaarteckel for long-haired, salchichas mini and teckel nain for the miniature are a couple examples, and should not be confused with puppy. 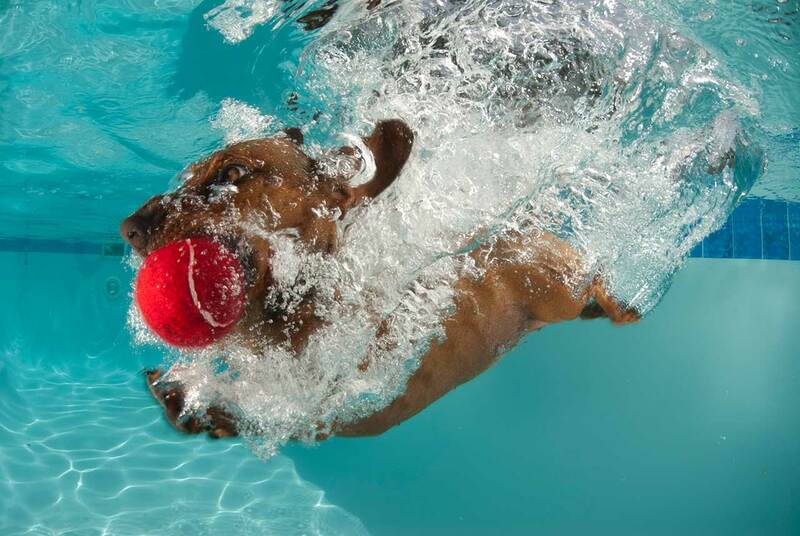 The Dachshund temperament is one with a great many conflicting traits. Still, it's this breed's very character that makes them so ornery, so clownish, and so lovable! The personality of these dogs is something you will have to get ready to live with — and to live with for a long time! — if you chose to adopt a Wiener Dog. You should know beforehand that these dogs are extremely clever, are very stubborn, are remarkably courageous, have erratic behaviors, and can exhibit unusual traits. Their characteristics have long made them a humorous target for film-makers and cartoonists. To your non-Doxie friends, this breed's disposition will seem odd. To sum it up colorfully, the writer E.B. White (of Charlotte's Web and other classic children's books) said of Dachshunds, "I would rather train a striped zebra to balance an Indian club than induce a Dachshund to heed my slightest command." If you are planning to have a family and adopt a dog, you will want to consider the breed of dog no less than other family-planning aspects. Many breeds are great for homes with newborns, small kids, and young children. The Dachshund, however, is one of those that is not recommended for such households. Unless you plan to spend a great amount of time and money supervising and training a Doxie, these dogs are not good with kids. They are good family pets with couple and single "parents." Dachshunds are very territorial and tend to bond very closely and protectively with a single person. It's not unusual for them to apply a pecking order to other family members they have elected to not bond with. They may go after a spouse when a newborn baby appears, and then target that first-born when the second sibling shows up, and then that middle child when the third infant is brought home. On the other hand, they are low to the ground and may look like a toy to little kids, and that can very quickly present problems if the child attempts to act on that perception. Teaching young 'uns to not see dogs as toys is just as important as shaping the Dachshund temperament with children. Dachshunds are excellent when in packs, but they are also a force with which to be reckoned. (If you know the "Far Side" cartoon series, you'll probably know the one about the mailman who stepped into a "nest of wiener dogs"!) They can get along with other breeds of dogs if they grow up with them and are socialized properly. The same goes with introducing them to cats, although this will require a great amount of patience and effort. Getting along with rabbits can be even harder as the rabbits will invariably run and the Doxies will definitely give chase. As for other pets, you may want to avoid mixing them with these dogs, as this breed was long ago meant to hunt creatures large and small. To understand why Dachshunds are like this, read the Temperament and History sections and you'll learn a lot more! Below are pictures of the Dachshund dog breed. Living with a Dachshund	is not as easy as it seems to be. These dogs are highly prone to separation anxiety. They also bark a lot — and constantly, and at everything. They are aloof to strangers and friends and may not always be friendly. Owning a Dachshund is a handful, to be sure. Because there are three different coat variations of their breed, a lot of people wonder, Are Wiener Dogs hypoallergenic? 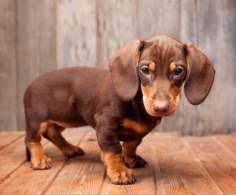 Yes, the Dachshund is hypoallergenic and in various degrees due to their coat length and to people in different ways. The allergic reaction you have may not be the same type or severity that someone else has because of the same dog. Unlike most movie dogs, many people were already familiar with Dachshunds due to the early Disney cartoons in which they were portrayed as coiled toys that stretched their already long bodies ridiculously so. The popularity of the 1966 movie, The Ugly Dachshund, was built not so much on a Doxie starring in it (although their was a pack of the breed alongside the starring dog, a Great Dane) but on the Dane being confused as a Dachshund. The Dachshund is one of those breeds that is not only well-known the world over but equally infamous for having a list of health problems that's longer than the typical Wiener Dog. Even worse are the multiple genetic issues that can happen when two dapple Dachshunds are bred, something that should never be allowed but still happens. The typical lifespan of the average Dachshund is 12 to 16 years.